Now, in a paper to be published in the journal Science, University of Rochester biologist John Jaenike and colleagues document a clear example of a new mechanism for evolution. In previous well documented cases of evolution, traits that increase an animal's ability to survive and reproduce are conferred by favorable genes, which the animal passes on to its offspring. Jaenike's team has chronicled a striking example of a bacteria infecting an animal, giving the animal a reproductive advantage, and being passed from mother to children. This symbiotic relationship between host animal and bacteria gives the host animal a readymade defense against a hazard in its environment and thus has spread through the population by natural selection, the way a favorable gene would. Jaenike provides the first substantial report of this effect in the wild in his paper "Adaptation via Symbiosis: Recent Spread of a Drosophila Defensive Symbiont," but he says it may be a common phenomenon that has been happening undetected in many different organisms for ages. Aside from shedding light on an important evolutionary mechanism, his findings could aid in developing methods that use defensive bacteria to stave off diseases in humans. Jaenike studied a species of fly, Drosophila neotestacea, which is rendered sterile by a parasitic worm called a nematode, one of the most abundant, diverse, and destructive parasites of plants and animals in the world. Nematodes invade female flies when they are young by burrowing through their skin and prevent them from producing eggs once they mature. However, when a female fly is also infected with a bacteria species called Spiroplasma, the nematodes grow poorly and no longer sterilize the flies, Jaenike found. He also discovered that, as a result of the Spiroplasma's beneficial impact, the bacteria have been spreading across North America and rapidly increasing in frequency in flies as they are passed from mother to offspring. Testing preserved flies from the early 1980s, Jaenike found that the helpful bacteria were present in only about 10% of flies in the eastern United States. By 2008, the frequency of Spiroplasma infection had jumped to about 80%. "These flies were really getting clobbered by nematodes in the 1980s, and it's just remarkable to see how much better they are doing today. The spread of Spiroplasma makes me wonder how much rapid evolutionary action is going on beneath the surface of everything we see out there," Jaenike said. He reasoned that the substantial increase in Spiroplasma infection was an evolutionary response to the recent colonization of North America by nematodes. As the nematodes invaded the continent, the bacteria proved to be a convenient and potent defense against the nematodes' sterilizing effect. Now, the majority of flies in eastern North America carry the bacteria, and the bacterial infection appears to be spreading west. 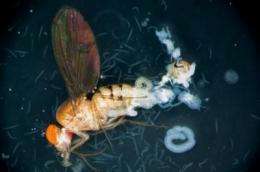 Without any mutation in their own genes, the flies have rapidly developed a defense against an extremely harmful parasite simply by co-opting the genetic material of another organism and passing it on from generation to generation. "This is a beautiful case showing that the main reason these Spiroplasma are present in these flies is for their defensive role," said Nancy Moran, the Fleming Professor of Ecology and Evolutionary Biology at Yale University. Moran studies the role of defensive symbionts in aphids. "These heritable symbionts are a way for an animal host to acquire a new defense very quickly. One way to get a truly novel defense is to get a whole organism rather than mutating your own genes that aren't that diverse to begin with." Jaenike's work could also have implications for disease control. Nematodes carry and transmit severe human diseases, including river blindness and elephantiasis. By uncovering the first evidence of a natural, bacterial defense against nematodes, Jaenike's work could pave the way for novel methods of nematode control. He plans to investigate that prospect further. Very bad title. This isn't evolution, this is meta-transcription. It's also a known pre-evolutionary mechanic by which life may have eventually came to the process of evolution. What a load of rubbish. Evolution started when the first self replicating life existed. What is this 'pre-evolution' that you speak of? No, evolution has a selective element. Meta-transcription is just utter randomness with no selective pressure. It is pre-evolutionary change. If the Fly, Bacteria, and worm were all created in the lab and the fly becomes infected by the bacteria there is no succession or selective pressure applied but the mechanic holds true. Evolution is change within a species over time. The above is preventative symbiosis in an individual. These are completely different things because the traits are not passed down from fly to fly without the collection of bacteria or infection of an existing organism. A woman with AIDS having a child will most likely pass that infection on to her children. You wouldn't call that evolution, would you? This is a similar mechanic, only with benefit rather than detriment. But what if the bacteria developed characteristics that conferred defensive advantages not to itself, but to its host? This would also encourage the survival of the bacteria. Evolution with a layer of abstraction. 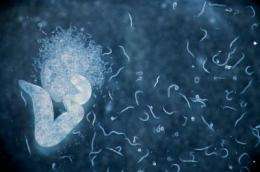 Do organisms evolve in a vacuum? No they don't, and that is why I'm saying this is not evolution. This is symbiosis. If the bacteria is evolving and gains a trait that is beneficial to it's host that benefit from the bacteria isn't "borrowing someone else's genes". It's symbiosis. There's no change in the information of the host. Another hypothetical that may be more apt than the above. Workers in south america have determined that eating coca leaves combats high altitude fatigue. Would you consider the consumption of coca leaves to be biological evolution if there were no changes made to the genome of either the plant or the human beings? I agree with you (almost) completely, but I have to point out that the authors don't claim genomic evolution, but rather another layer of evolution, adaptation by symbiosis. While I doubt the partnership between the bacteria and the fly will be long lasting, some cases of these kinds of partnerships (look at most theories on chloroplast and mitochondria origins, for example) can lead to novel, defining traits in organisms that are very important to them on an evolutionary perspective. Then again, I may be looking too deep into this. If the symbiotic partnership persists from generation to generation, and the source is not species genetic, then where do it come from? Can symbiosis be considered a sort of distributed genetic adaptation?